I have started this new school semester off pretty well with my kids, at least for my read aloud time (we are working on getting the rest of the stuff on the schedule…Brave Writer is coming along nicely too!) Read aloud is my favorite time of a day…and my kids still enjoy it as well. We always have a fiction book we are working on, and now, as per Julie Bogart of Brave Writer’s ideas…I am also reading an assortment of other books during our read aloud time, which kicks off our learning time of the day. So, one of the things I decided to add to our pile is at least one picture book weekly. I am a huge collector of fantastic picture books, and there’s so many on my shelf that we’ve either never read or haven’t read in a very long time so my kids don’t even remember them. So I’m pulling those things out and reading one a week to my kids, mixed in with the other stuff. So I was just thinking today that these books are fantastic and I should be sharing them with people! So I’m going to start doing a “Book of the Week” and share what our week’s picture book is, and maybe a short review, if I feel up to it. 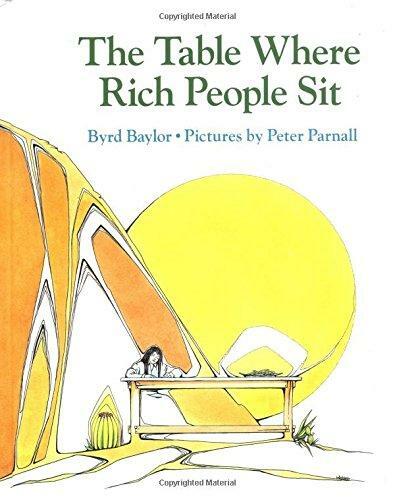 This book is so wonderful, and talks about how you can be rich even if you have very little money. The story is narrated by a young girl who doesn’t think her parents are working hard enough to bring money home, and wants some changes made…but through the course of the book, her parents detail how rich they really are, in all the precious experiences they have in their lives and lifestyle. I love how this book really emphasizes the value of the non-monetary. It really makes you think, and the pictures are really unique. It’s not my favorite style of art, but Peter Parnall’s art has grown on me for it’s quirkiness and emotion evoking style. It works. Check out this book with any age. I think most kids will get the message from it loud and clear!